So I heard a rumor that Neegan is coming, and instead of killoing Glen he kills Daryl? What have you guys heard about that? Posts: 1761 I would so watch if this happened! Or if my one year old gave me time too. Also, Siekone!!!!! I'm so happy to be back in business! Yeah, it's just been sitting here collecting dust for a couple years and no ones touched it, like a empty house with the door unlocked. I think I started that rumor on Facebook a few weeks ago. Posts: 1761 Smash! Smash! Sssssssmmmmmaaasssshhhh!!! DEEP BREATH and BIG STRETCH! ...wow, it's good to see your guys faces again. It's been a really long time! Did I miss something about "Glenn's death"? When I watched that episode, I was pretty darn sure I saw GLENN fall off the dumpster and saw him get his chest ripped apart. (mind you, if you look at the scene carefully enough. They had zombies on the fence behind them, zombies entering the alley, and a brick wall. On the other fence, there were trees with no evidence of zombies. They had PLENTY of time to jump/climb that fence and juimp into those trees and run! As far as the 'negan' scene. I agree, that was my first theory, when Daryl was in the forest with those 3 people. The truck was pretty big, knocking down trees, however, I feel there were far too little guys jump out of the truck. Negan deserves a much better intrance than that. If they were hinting at it, I can accept that. But, they gotta knock the viewers off their feet when they introduce him. When reflecting on the comic, he had a small army of guys on RICK and CO. I don't fully remember what brought on that MASSIVE hoard at Alexandria (comic), which they spent several comics fighting off (which is where Carl lost his eye) etc. But, it was when that hoard got finished off, is when "Jesus" (paul) was found spying on them. "Jesus" introduced himself violently, then introduced the crew to HILLTOP, which is where we learned about NEGAN. I bring all this up to subimt, if this MASSIVE zombie hoard is meant to reflect what happened in the comic (was it issue 80-90? ), then the show is setting up to reveal HILLTOP. I feel it's too early for NEGAN. When MORGAN was fighting off that gang with the "W" (wolves?) on their foreheads, the one guy said, "we don't have a choice". 2. the guy with the big truck is the head of the WOLVES. I would REALLY like to see those zombies (who are at the walls of alexandria) start breaking through, and then spent a whole episode or two blasting through them all. That would be an action packed episode. ...I'm going to have to check out that episode of "glenn's death" again. I was pretty darn sure it was him getting ripped apart. You guys are making me question myself, that he actually escaped. OK, after reviewing the episode, now I understand what you guys are talking about. 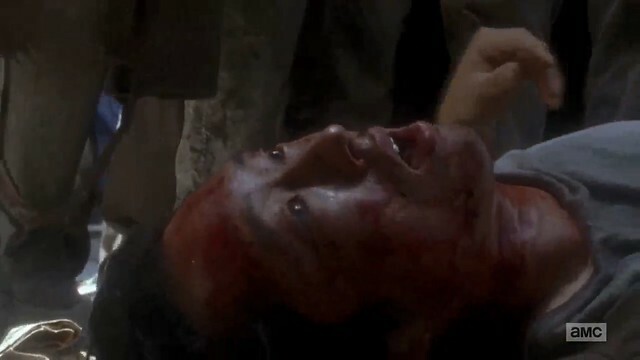 You theorize the dude Glenn was with (who shot himiself) landed ON glenn, when they fell off the garbage bin. when you look are image 1 up there, compared to image 2. There is clearly nothing ON glenn in the image above. Momemts later, we see the zombies ripping apart something. Glenn is showing obvious discomfort and anguish. BUT, is he suffering because he is being ripped apart, or because the dude he was with is on top of him getting ripped apart? I tried to go frame by frame to get the best image, and the second image was (in my opinion) the best image. 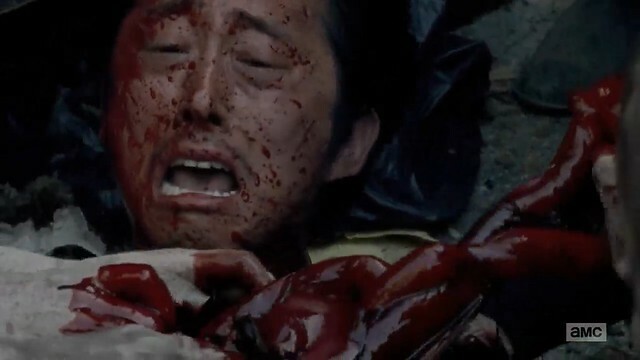 The internal guts seem to be in the right spot for glenn's body. The other guy would have to be T-boning glen, or at least, on a 45 degree angle. In conclusion, if your guys theory is correct, it's a fabulous theory, if that dude landed on Glenn, and they're all eating him, giving Glenn just a moment to get away. That would be an epic escape!